GTK+ ≥ 2.14, GStreamer ≥ 0.10.17 (including gst-plugins-base and gst-plugins-good). For MP3 support you also need gst-plugins-ugly. Disable update check by default. Added translations in 8 more languages (totalling 16). Added a menu bar, cleaned up the tool bar. Switch from GStreamer to FFmpeg libraries for audio decoding. This speeds up the overall analysis by a factor of 1.5 to 2. 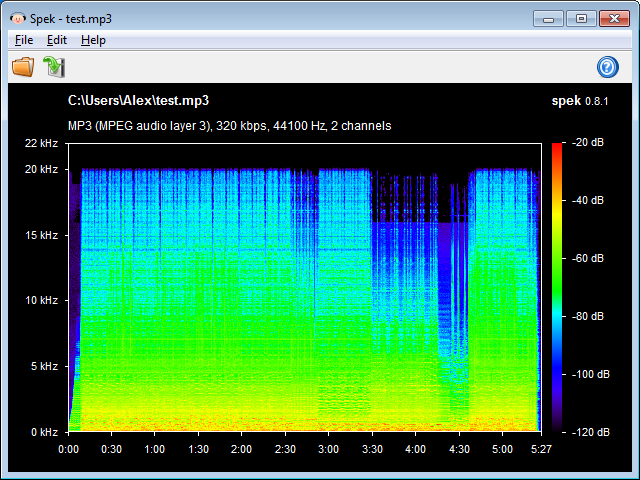 Decode audio and perform the analysis in separate threads. This makes the analysis 1.3~1.8 times faster on multi-core systems.